Help Me Contribute to the Lives of Millions by Making Your Contribution to World Happiness!! 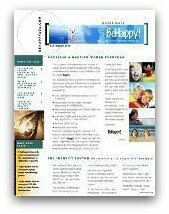 If the information on this site helps you and you'd like to make a donation to BeHappy101.com, please click on the button below. The amount you donate is entirely up to you and would be greatly appreciated!! to be a positive, creative force for health and happiness. So I started this website to help people live happier and healthier. First, as mentioned in the box above, my mission in life is to be a positive, creative force for health and happiness ... so, I want to spend my time - and my life - helping make people happy by helping them create better relationships, make more money, become more successful, and enjoy life more. If you want to support me in this mission, please make a contribution. Any amount is appreciated and will help keep this site growing and helping others. Next, contribution is one of the essential features of a totally happy life. In other words, most of us cannot be really happy - I mean at the deepest level - without contributing something on a regular basis. It may be your time (as a volunteer, for example), your money, your expertise, or just your "ear" when someone needs you to listen. My wife, Jill, for example, used to take our golden retriever, Sunny, to the local children's hospital regularly to visit sick children. It's amazing how he would brighten those kid's day by just being there to let them pet him or play with him. It's also amazing how it brightens Jill's life to contribute something so simple to those sick children. We think it would even brightens Sunny's day, too. to contribute to people's happiness as well. Because, as part of our mission to create joy, happiness, and fulfillment in the world, we will contribute to those who need help being happier because we want to make our world a better, happier place. So, just click on the "Donate Now" button below to make a small contribution to help keep this website alive and growing. We will, in turn, contribute a portion of the proceeds to help people BeHappy! Okay, so if you prefer not to make an outright "donation", you can still contribute "indirectly" by purchasing something from AMAZON.com or an AFFILIATE through this website. Just purchase a product by using the Amazon search widget to the right or by clicking on one of the AMAZON.com or other product links throughout this site and BeHappy101.com will get a small contribution (a commission) for the purchase. There is no increase in cost to you, just a donation made by Amazon.com or one of the affiliates to BeHappy101.com. Click here to check out some of my favorite products.